In the midst of the bustling Inner Sunset Street Fair on Sunday, a canvas on the corner of 10th Avenue and Irving Street re-imagined the street as an inviting, car-free public plaza. This is just an idea — but it could happen if we wanted it to, read the text accompanying a photo-realistic rendering of a pedestrian plaza on Irving Street between 9th and 10th Avenues. “I’ve been wanting to do this for about twenty years,” said designer Chris Duderstadt, who lives around the corner on 10th Avenue and has worked on engineering projects in Golden Gate Park. He introduced his vision to the neighborhood for the first time at Sunday’s street fair, the only regular opportunity for the community to use their streets as public spaces. “Imagine this seven days a week,” said Duderstadt. The rendering drew a rotating crowd, as groups spent several minutes at a time in front of the canvas discussing what the project could do for the neighborhood. 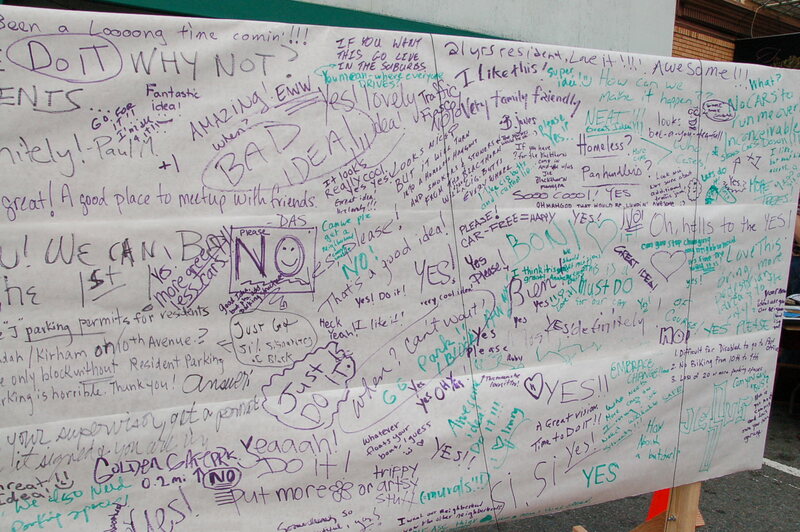 The rest of the paper canvas was covered by written comments reflecting an overwhelmingly positive response. The block of Irving between 9th and 10th typically feels more like a parking lot than a commercial street. Although many businesses line the sidewalks, few amenities attract people to linger. Residents can venture into the recreational open spaces of Golden Gate Park, but the plaza would provide a place to meet within the neighborhood itself. The plaza concept met with an enthusiastic reception from District 5 Supervisor Ross Mirkarimi and neighborhood SFMTA Board member Joél Ramos, who both attended the fair. Duderstadt pointed out that it would require a long-term sponsor on the Board of Supervisors to see it through. Mirkarimi’s supervisor term ends in 2012, and he is currently running for sheriff. The neighborhood’s first parklet, located on 9th Avenue in front of Arizmendi Bakery, has seen no shortage of visitors since it opened last month. Parklets, said Mirkarimi, can serve as incubators for more expansive reclamations of public space. I live just around the corner on 10th Ave. and ride through that block each day to cross over into Golden Gate Park. Going to Lincoln isn’t an option because it’s unsafe for cyclists and you can’t make a left onto 9th / MLK from it. Re-routing cyclists up to Judah is also a bad idea because you can’t make a left onto 9th from Judah. Not to mention the fact that you’d then have cyclists contending with LRVs and their tracks. Do building owners want it so that they can kick out current commercial tenants and make more money from the new nicer, store fronts? If that is the case one solution is to not just do this in one spot, and certainly not only in the nicest spots, and to do all of them at the same time. It’s certainly not on the scale of recent changes in Times Square, but there are some valid comparisons. Commercial real estate prices went up 80% in near where heroine Janette Sadik-Khan did her stuff in NYC — you can imagine who can and who cannot afford that. And still when people protested there on the weekend, another lieutenant of Bloomberg had people beat up and charged with horses. What was the impact on the N and the 44 when Irving (bet. 9th and 10th) was closed this weekend? I would be concerned that confusion from drivers when they realize they cannot go down Irving could potentially lead to a more messed up 9th/Irving intersection. Perhaps this is an opportunity to finally make separated transit only lanes on Irving (similar to those on Judah) to separate the N from congestion? Neither the 44 nor the N travel between 9th and 10th ave. on Irving St. I live right in those blocks and there was no impact to traffic this weekend, but it was a nice neighborhood time! No, ‘Guest’ you’re confused. He’s worried about the impact that car traffic diverted from 10th to 9th might have on the 44 and N.
Should have been a bit more specific. Good to hear traffic was free flowing this weekend! If the project will not slow Muni (and potentially can be coupled to transit improvements to speed Muni through a very busy area), I think it could be a big plus for the neighborhood! The street fair was a huge success and it was also not a chain-run thing with $10 kebabs and B of A hustling for deposits. It was really nice to see the community come together for this. 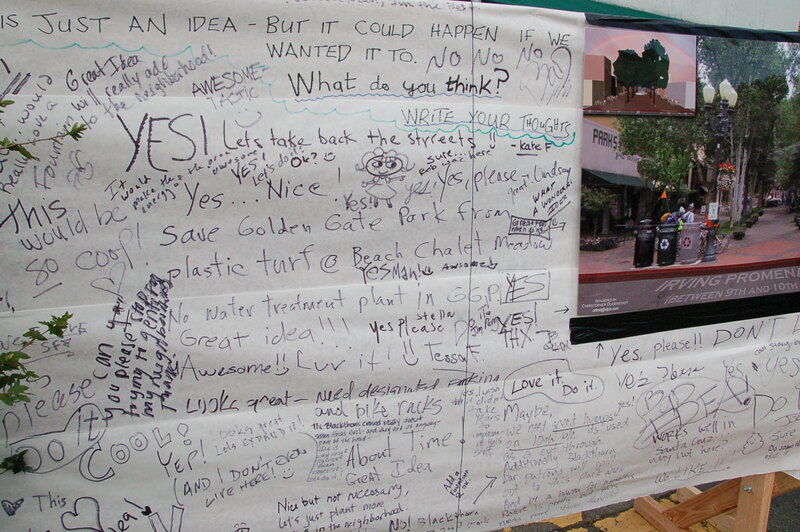 Likewise when the parklet was proposed, over 1000 residents signed petitions as did almost every local business. This idea is very intriguing. Naturally, this is a concept at this stage, and not a final proposal, so NIMBYs need to STFU and instead provide positive ideas to make something that works long term. If anyone has ever been to Santa Monica and seen the transformation of 3rd street into a pedestrian/bike friendly zone that is thriving, you know how good this can be. LA is beating SF in making neighborhoods more friendly to transit and business, and sure, property values would go up, but they’re going up anyway because this is SF. I live a block away from the proposed site, and can see some challenges with traffic but that’s nothing new. 8th avenue is a parking lot for big trucks making deliveries and a speedway for people who are avoiding 9th as is, so I dont see this making it much worse. Also, aren’t we transit first or is that faux rhetoric by politicians? Go Inner Sunset! Show Noe Valley that you are a more enlightened, progressive, creative and imaginative neighborhood that puts community over protecting car-culture at all costs. (Note: I live in Noe Valley.) If just one neighborhood does this and shows positive results, other neighborhoods will follow suit. Not every street in San Francisco needs to be a car-thoroughfare. There might be confusion for a week but then people will figure it out. Giving each neighborhood a central car-free space is an excellent way to build strong neighborhoods and communities. Making some streets permeable only to pedestrians and bikes also encourages both walking and biking, lowering health care costs, improving air quality, etc, etc, etc. Karen – it could happen, and I would suspect whoever is suggesting this took some notes. Throwing the concept out there at a street fair gets it visibility from potential supporters and builds the support first – good strategy. Also, they have Ross, we had Bevan. Hmm… if Ross becomes Sheriff, the new Mayor appoints his successor. Think about that when you are voting for Mayor. Good points above. I can’t imagine this working without significant planning on nearby streets for increased parking and bike lanes. But where would the bike lanes go ? Slant-in parking could help on the south side of Irving from 10th to 14th Avenues, perhaps. But Lincoln is a major arterial route and could not safely accommodate a bike lane. Putting bikes on Judah won’t work because of the N-Judah. Carrying this through without figuring this out will result in pedestrian accidents, and bikes being hit by or hitting cars. It’s all very cute, but something else occurs to me. Most of the businesses on this street are functional rather than conducive to cafe seating. I’d really rather that the post office, Sterling Bank, big grocery and small Korean grocery stay as they are. None of them might survive this plaza (as poster noted above). IMO, there’s plenty of room for both pedestrians and bikes. Clearly the plan preserves two lanes for deliveries and local access. These could be used by bikes as well. Put up a “yield to pedestrians” sign, so that bikes don’t travel at high speed, but otherwise I don’t see a problem. While it’s true that it may drive up rents and drive out some of the existing businesses, I think it’s a shame to block improvements on that account. By that standard we should support policies which make the city more unpleasant and drive out people because they will reduce property values and rents. Baklazhan: No, that is not what I am getting at. What I am getting at is that improvements like these need to be countered by laws which make them sustainable transitions, rather than just transitions. @7fa0d6c79641ac36b8403833fb96687d:disqus There already is slant-in parking on Irving between 10th and Funston. And as someone who frequents the two groceries on that block I’d hate to see any changes that negatively impacted them. If we lose them then the livability of the neighborhood goes way down. This is one of the more amazing projects I’ve seen recently. Just the kind of thing parklets should be inspiring. Really makes me appreciate how lacking we are in public space in this city. Cute idea. not much more. I can applaud the effort, but not well thought out for revised traffic patterns. deliveries and traffic. This is also not “hang out at a sidewalk cafe” type of climate. Fantasy, cute, that’s all. Back in the 60’s, when the growth of suburban shopping malls killed off downtown retail, many cities responded by turning their downtowns into pedestrian malls. It was mostly a disaster, and many were converted back. Lincoln Road in Miami Beach was a fashionable shopping street until the big new hotels like the Fountainebleau opened with lots of shopping. Then Lincoln Road was turned into a mall, and it became a ghost town. It was not until they decided to let restaurants put LOTS of tables out on the pedestrian mall that it came back to life re-purposed as an entertainment district. Point is, you need to think really carefully about what businesses are there now, how people get to them, and how the street is being used. Is there a craze going around? Some of San Rafael’s Fourth Street might get converted to a pedestrian road, too. I think the climate concern is not very valid. I lived in Antwerp, Belgium, for the first 20 years of my life, and the major roads and squares were made car free at that time and I would hardly call that climate cafe type. The traffic there just got routed around the car free streets, which can happen here as well. People there love to walk and shop outside and is preferred over indoor shopping malls. Our family had a store inside a shopping mall in Antwerp and that mall died while the outdoor mall is still thriving. Cafe’s sitting areas come out when the weather is nice, which would be Sept-Oct time frame in our neighborhood, which would be great. During the other months, we would have a great place to congregate, hang out and walk or just enjoy a car free area. We could have some space for street art and a kids play area, trees, etc. 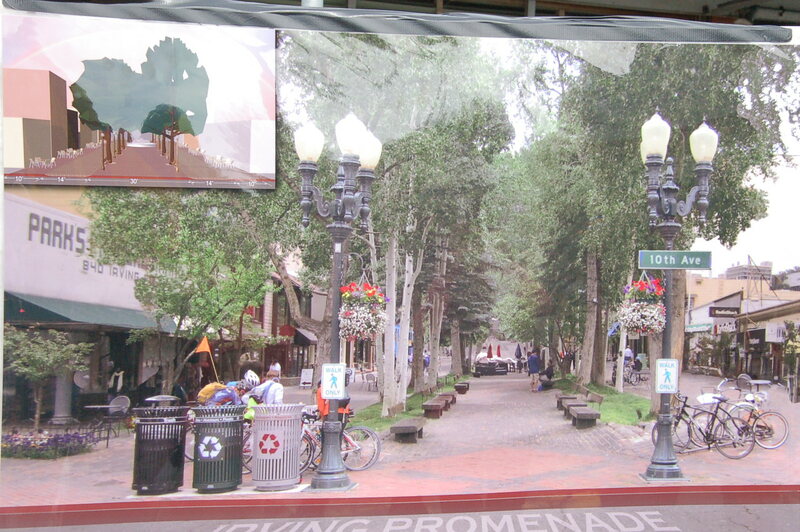 Boulder did the same thing with the Pearl Street Mall. The Pearl Street Mall was and still is an enormous hit and was a big factor in the demise of the Crossroads Shopping Mall, an indoor suburban style mall. Of course, now the area that was the Crossroads Mall is now a mall again, but they demolished it and built an inverted mall, where the spaces that traditionally were walking areas indoors are now streets and parking. I think the photo-realistic mural left out the sleeping bags, cardboard shacks and homeless drunks, alcoholics and psychotics talking to themselves. Sacramento’s K Street mall is an example of a disasatrous conversion to a pedestrian mall in the 1970’s. In the 1980’s they brought light rail to K Street, another urbanist panacea and it didn’t get any better. Stop the K-Streetification of Irving Street! And Godwin’s law of Street plazas is satisfied with the invocation of K-street. It will destroy businesses and become a homeless encampment! No, it will be so successful like Times Square in NYC it will drive up rents and chase businesses away! Dire predictions were also made about the 17th St. Plaza in the Castro and they didn’t come to pass. Many thought that shutting down Broadway in Times Square would be a disaster along every conceivable measure. It turned out to be enormously popular and a watershed transformation of a livable street. The only way to really know what will happen is to set up a reversible pilot of it and see. Experiment, get feedback, modify, correct, improve. Cities and the needs of the people in them are always changing. It’s those cities that don’t adapt and modify that end up in decay. I certainly agree that if something isn’t working, don’t continue on with it, but in a city where density is increasing and will continue to increase due to rising energy costs, our communities truly need to become less auto-centric to flourish. Simple solution is to walk bikes for a block. Lincoln Road then, if you prefer. The point remains that outdoor pedestrian mallification is not the panacea its advocates proclaim. Those sanitized architectural aren’t how people live; they exist only in urban planners fever dreams. Great start, but I’d like to see it thought out as a neighborhood plan, connecting the GGPark museums to 9th & Irving shops, maybe eventually to UCSF. A one-block promenade at the side of the business district isn’t enough to make it a viable destination. Locals from the neighborhood (myself included), people from around the city, and visitors to the museums need a promenade with food and shopping, where you can spend time, walk around with a friend or a dog, grab a snack, have dinner and drinks before/after a Nightlife event at the museums, have lunch or grab supplies for a picnic in the park. There’s as much or more of a need for that kind of promenade at 22nd & Irving, where you can go with your friends to get dim sum or tapioca drinks, and then all you can do is stand outside in the cold in front of your car and drive off. I might also add that in the cold foggy Sunset, walking around a promenade would often be preferable to sitting in a one-block plaza. In addition to the length of the pedestrian plaza, to make it a viable destination, the business district needs a better connection to the museums in the park. As much as I want to keep the lines down at my local favorites, I’d be happier to see more businesses come in, supported by the museum visitors. It’s ashame that there’s not obvious wayfinding markers and gateways funneling visitors from the museums to frequent the local eateries a short walk away. 9th Avenue should be part of the plan for a pedestrian promenade (not ped-only so the 44 can still run through), as well as some consideration for the walkway from the museums to the neighborhood. Finally, it’s important to think about parking. Personally I don’t own a car, but most people I know in the Sunset get around by car, and any pedestrian plaza is going to get major push-back from people wanting parking. Instead of taking away valuable street space for parking, I’d much prefer wider, more promenade-like sidewalks, and some consideration for bicycles. Considering that a lot of people will still drive to 9th & Irving, and that there will be a lot of business advocates for those drivers, off-street parking should be part of the plan. Ideally, parking would be located near Lincoln, so people can get in and out quickly by car without marauding around neighborhood streets looking for scarce parking. Anyway, I’d love to have a walkable promenade in the Sunset, and visions like this one are a great start. Rather than waste money on this why not fund the Arboretum to make it free for all again? Why waste your time relaxing in a pedestrian mall when you have Golden Gate Park just a block away. Fully agree. 22nd and Irving is now what 9th and Irving used to be. environmental problem we wish to avoid? the long-term and who pays to maintain it? deliveries? What streets will the delivery trucks use? plaza idea a solution in search of a problem? people have slept in doorways and on benches? the streets cleaner and maintaining our sidewalks and trees. It’s interesting how this individual puts a spin on statistics. If 19% of renters do not own cars, this means 81% do. There are about 100 renters on 10th Avenue, between Irving and Lincoln. 10th Avenue will get the brunt of this fantasy project, we already are having a major congestion problem with delivery cars and trucks, closing off Irving will make it very difficult for those who have to drive to work to get out of their driveways and to find places to park on the street. if 30% of Inner Sunset residents take public transit, 7% walk, 2% bike and 7% work at home, this means that the majority, 54% depend on their automobile. Since 85-87% of pedestrian malls fail in the U.S. (by fail I mean they are converted back to regular streets after around 5 years or so) why would the Inner Sunset be different? And considering that the few pedestrian plazas which do succeed are either 1) within walking distance from the beach, or 2) within a short walking distance from a major university (not UCSF which is a medical/teaching school) or 3) in the downtown area of the city, it is highly unlikely that closing off Irving street won’t produce more problems than in solves. Which gets me to this point: What exactly does this plaza purport to do? We already have a thriving community in the Inner Sunset, there are many cafes and restaurants with both indoor and outdoor seating for neighbors and friends to mingle, socialize and meet. I myself see neighbors and friends nearly every day at a cafe about 1 block from my home. We also already have a world-class urban park with benches, grass, trees, walking paths, museums, an arboretum and places to engage in sports one block away from Irving and 9th. The Inner Sunset definitely does not need a pedestrian plaza! When a street is closed, but the number of cars remains the same (or increases as the proponents of this plaza idea hope it will as supposedly people from other areas of SF and the Bay Area flock to the Inner Sunset to sit in the plaza, shop at nearby stores and eat at nearby restaurants) the traffic on 8th, 10th, Lincoln and Judah will become even more of a mess than exists today. The laws of physics are not suspended by human desires and hope. Since the Inner Sunset is one of the foggiest areas of SF, often 15 degrees cooler than the Mission, why people would come here to sit in the plaza is hard to imagine. Keep in mind that there are Radio Shacks, restaurants, post offices, hair cutters and Bank of Americas all over the city. I am all for beautification and I love grass and trees and fresh air. That’s why I walk in GG Park three or more times a week. Let’s do something for the neighborhood that will benefit everyone, not hurt those who’ll have to live next to the increased congestion and those who’ll have to be driving around wasting fuel looking for parking while navigating a closed-off street. How about planting more trees on Irving? How about fixing potholes? How about encouraging small businesses rather than chain stores? I am sure others can think of ways to beautify the neighborhood and sustain the community that is ALREADY HERE. Lacking in public space? San Francisco has one of the largest city parks in the nation. Which is routinely used as a speedway by cut-thru drivers.